Following an appeal from advocates of an academic boycott on Israel, physicist Stephen Hawking recently turned down an invitation to speak at a conference in Jerusalem. He joins others who have boycotted Israel in one form or another, particularly in reaction to the horror of the 2008/09 Gaza war, the killings of Turkish aid activists on the May 2010 aid flotilla, and the week of attacks on Gaza last November. 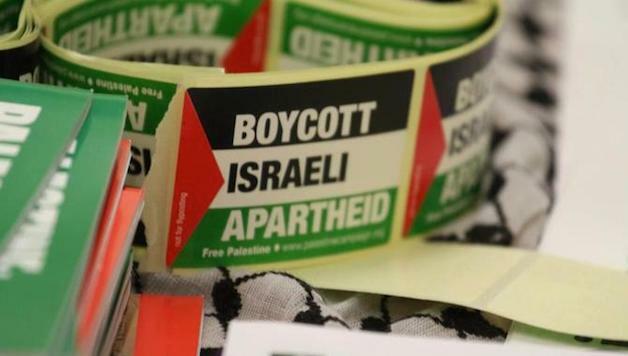 What attitude should trade unionists and socialists adopt towards the boycott campaigns? JUDY BEISHON takes up some of the questions frequently raised. When did the boycott campaigns arise? There were various calls for sanctions and boycotts – including by some Israelis – following the start of the second Palestinian intifada in 2000, which was being met with great brutality by the Israeli regime. Sanctions were discussed at a United Nations conference against racism, held in South Africa in 2001, which the US and Israeli delegates walked out of. Then, in 2002, a boycott was called for by a number of Palestinian organisations. And, in 2004 in Ramallah, an academic and cultural boycott of Israel campaign was launched. A year later, a Palestinian ‘civil society’ request for ‘boycott, divestment and sanctions’ (BDS) was made, until Israel “fully complies with the precepts of international law” by ending its occupation and colonisation of all Arab lands – referring to those taken in the 1967 war. It called for dismantling the separation wall, recognition of the rights of Palestinian citizens of Israel to full equality, and respect for the rights of Palestinian refugees to return to their properties. These demands are rightly supported by most labour and trade union organisations around the world. Many have also supported the call for BDS, although in many cases they are selective, justifiably, about which aspects of the campaign they support. International solidarity is important for the Palestinians, isn’t it? Yes, the Palestinians in Gaza and the West Bank are living in terrible conditions and suffer regular incursions by the Israel Defence Forces to kill and intimidate. The Israeli military’s virtual blockade of Gaza has led to very high levels of poverty, malnutrition, unemployment and frustration in that densely populated strip of land. There is revulsion and anger among workers internationally at the Israeli regime’s brutality and repression, and an understandable desire by many to support boycotts and sanctions if they can have some effect. The poor living standards, discrimination suffered, and unfulfilled national aspirations of Palestinian refugees in the surrounding countries, and of Palestinians in Israel itself, also must not be forgotten. Can boycotts play a role in the Palestinians’ struggle? Some types of boycott can both increase awareness of the Palestinians’ plight and be useful as auxiliary campaigns alongside other actions and support. They can contribute to the Israeli ruling class’s increased feeling of ‘isolation’ in the world arena, putting added pressure on it to make concessions to alleviate some of the Palestinians’ suffering. They can also, in some cases, dent the profits of Israeli capitalists and of multinational companies that are profiting from the Israeli occupation, bringing additional pressure to bear. Broadly speaking, however, these are the limits on what boycotts are likely to achieve. The central driving force of the Palestinians’ struggle for liberation needs to be mass action by the Palestinians themselves. This, led and organised democratically by Palestinian workers, has the potential to be incomparably more effective in advancing their struggle than boycott action from the outside can be. Palestinians carried out mass actions in the first intifada that began in 1987, and which led to the concession of the Oslo peace process and the setting up of the Palestinian Authority in 1994. When that process failed to deliver concrete improvements and Jewish settlement building continued, the second intifada eventually broke out which, unfortunately, moved away from mass action. Secretive groups and organisations mistakenly resorted in desperation to suicide bombings and other attacks on Israeli civilians. More recently, though, inspired by the magnificent 2010-11 Tunisian and Egyptian mass uprisings, there is the start of a new generation of Palestinians moving into struggle. Some large demonstrations of Palestinians in the occupied territories and in Israel have taken place, including protests in solidarity with Palestinians held in Israeli jails and workers’ strikes against austerity measures. These movements need to be armed with plans for escalation, both against austerity and the occupation. Democratically planned mass struggles could be organised against many targets, including the separation wall, land seizures, the blockades and brutal operations by the Israeli military. The Tunisian and Egyptian workers and poor showed how effective mass action can be, even though their revolutions have not yet rid them of capitalism. International boycotts and sanctions would not have removed the former regimes in those countries; a long period of sanctions by the western capitalist powers against Saddam Hussein’s regime in Iraq did not remove it. Nor are western imperialist sanctions removing the Iranian regime. On the contrary, that regime uses them to bolster its support base, and ordinary people in Iran bear the brunt of the extra hardship that sanctions deliver. First and foremost, workers internationally need to assist the Palestinians whenever possible with the task of building their own independent workers’ organisations – independent of NGOs, big business and pro-capitalist politicians – so that the Palestinian masses can democratically decide for themselves how to advance their struggle and lead the way in doing so. This means trade unionists internationally building links with organised Palestinian workers and offering material help. Carefully targeted boycotts can supplement this, but they shouldn’t become a substitute for supporting active, mass struggles and feed a false idea that boycotts – a relatively passive form of action and one from outside – can deliver Palestinian liberation. As well as fighting the occupation, Palestinians in the West Bank and Gaza face the task of removing their pro-capitalist political leaders, to lay the basis for an entirely different form of society: one based on a socialist programme that can serve the needs of the majority, rather than an elite at the top. A majority of Israeli workers support the creation of a Palestinian state, but don’t support boycotts. Why is this? There is growing questioning and unease among Israeli Jews about the occupation of the territories and, consistently, two-thirds of them support the idea of a Palestinian state. But there is intensive propaganda from the Israeli government and media that justifies a stranglehold on the territories as essential for Israel’s security. Rocket attacks from Gaza onto Israeli towns are seized on as a reason to step up the repression, and the separation wall and restrictions on movement are declared necessary to protect Israelis. A siege mentality is also fed by fears of Israel being attacked from neighbouring countries, especially Iran. As part of all this propaganda, the BDS campaign is portrayed by most Israeli mainstream politicians as anti-Semitic and as a rejection of democratic debate. Israeli Jewish workers genuinely fear for their own security and want to protect the state that was intended to be a safe haven for Jews. This, with the constant barrage of propaganda, unsurprisingly leads them to believe that advocates of the BDS campaign around the world don’t understand the situation in Israel. Also, many of the Israeli Jews who are most critical of their government’s brutality against the Palestinians, at the same time don’t see why Israeli workers should be punished for it by suffering the effects of boycotts. So it needs to be taken into account that boycott campaigns can assist the propaganda of the Israeli government domestically, and can create a barrier between workers in Israel and internationally, negative consequences that need to be weighed up against the advantages. Should all BDS campaigns be avoided because of the viewpoint of Israel workers? Not necessarily, because some types of selective boycott or sanctions can aid the Palestinians’ cause while, at the same time, coming across to Israeli workers as less hostile to them than blanket boycotts of ‘everything Israeli’. ‘Selective’ can mean targeting the export to Israel of arms and equipment that could be used against the Palestinians; firms that profit from the occupation; goods produced in the Jewish settlements; certain sporting and cultural events to gain publicity; the Ariel university in the occupied territories; Israeli ministers when they make overseas visits – among other possible targets. It can be clearer to Israeli workers that boycotts aimed at such carefully chosen targets are directed at the Israeli establishment rather than workers, especially if accompanied by a supportive attitude by the boycotters towards Israeli workers’ struggles. In 2011 a campaign to boycott Ariel university was signed by up to 145 academics in Israel and more have since added their support. Academics internationally should support that campaign rather than backing a boycott that shuns Israeli academics indiscriminately. Boycott campaigns directed at non-Israeli companies can also play a role, for instance of Caterpillar for exporting bulldozers fitted with machine guns, or French company Veolia for providing services to Jewish settlers. In May 2011, German rail company Deutsche Bahn pulled out of laying tracks for a Tel Aviv to Jerusalem train line because part of it went onto UN-designated Palestinian land. It is important that the Palestinian workers’ organisations are consulted on boycotts as, for instance, some of the targeted companies employ Palestinians who could be affected. Also, the Israeli government may take retribution by inflicting sanctions on the Palestinian Authority or through other measures. Many Palestinians, though, support boycotts despite the possible repercussions. Blanket boycotts of ‘all things Israeli’, as well as particularly alienating Israeli workers, don’t focus on what would be most effective. Also, some products are near impossible to avoid, as many goods made in Israel are parts of final products assembled in other countries and it is common for Israeli companies to hide their identity in the global arena – or pass goods through another country to change their ‘origin’ – to pre-empt boycotts or criticism. Furthermore, consumer boycotts are very difficult to monitor and build. They rely on the decisions of disparate individuals, many of whom reject participation or have insufficient information to make a decision, as the campaigns are rarely promoted in the mainstream media. Some campaigns are initiated by small groups and advertised mainly on internet sites, and are not always democratically run. Trade union organised sanctions have more powerful potential. Trade unions have the structures to allow democratic discussion and planning of action and members who can deliver it. In 2009, South African Transport and Allied Workers Union members showed one type of possible action when they refused to unload an Israeli ship that docked in Durban. Another major problem with blanket boycotts is that they are often promoted by organisations or groups that dismiss all Israelis as colonial settlers and are very hostile to the Israeli working class, writing it off as adopting Zionist or racist ideology and incapable of acting as a progressive force. Some organisations don’t even accept that Israel has a working class. However, while BDS campaigns can help express outrage and hit the interests of some of the Israeli capitalists, the much bigger threat to the profits of those capitalists lies in industrial action by Israeli workers. Boycotts are an irritant to the Israeli ruling class compared to the threat that determined action by Israeli workers can be to their profits – and, eventually, to their rule. But will Israeli workers move into struggle against the occupation? There are regular struggles in Israel against job losses, privatisation, low pay, service cuts and on other workplace and social issues. In 2011 there was a vast ‘tent city’ movement against the chronic housing shortage, high rents and ‘social injustice’ in general. This included demonstrations of unprecedented size, involving hundreds of thousands of people. In 2012 there was a four-day general strike to win improvements for contract workers. During the last three years alone there have been strikes in Israeli hospitals, among social workers, at Haifa chemicals, on the railway, the airline, and many others. Many of the disputes involve Jewish workers fighting the bosses’ attacks alongside Israeli Palestinian workers in the same sectors or workplaces. This forges unity in struggle at rank-and-file level, although the union leaders usually try to avoid raising the issue of the particular discrimination faced by Palestinian workers. Israeli governments have stepped up attacks on the democratic rights of Israeli Palestinians, but also on those of Jews. For instance, a law passed in 2011 allowed anyone calling for a boycott of Israel to be sued by the boycott’s target even if no ‘damage’ was caused. What about the occupation? With no mass Israeli workers’ party in existence, yet, that can develop a programme both of advancing the present battles of Israeli workers and aiding the Palestinians’ struggle for self-determination, there is general despondency on the way to end the occupation. But the further development of workers’ action on both sides of the national divide, and eventual moves to form new workers’ parties, will start to change this. In the January 2013 general election, 17 parliamentary seats were won by newly formed party, Yesh Atid, which pledged to represent ordinary people. This pro-capitalist party, led by millionaire Yair Lapid, is not delivering on its promises already. Lapid took the job of finance minister and is driving through austerity measures. But his party’s sudden rise shows the electoral ferment as voters search for an alternative to the usual failed and corrupt capitalist politicians at the helm. Working-class and middle-class Israeli Jews have nothing to gain from the national conflict. It is their ruling class that presides over it and has an interest in maintaining it. Anger against the rule of the ‘tycoons’ in Israel – expressed recently on the streets in protests against the new budget – will fuel developing consciousness on the need to challenge the mainstream political parties with a left alternative. As the Palestinians in the territories advance their own struggles, if a supportive approach is taken by Jewish and Palestinian workers towards each other’s battles, links and solidarity can develop with mutual benefit. As part of this process, socialist ideas can gain an echo and take hold, as the only path towards solving the issues that are unsolvable under capitalism, to achieve two socialist states side by side, Palestine and Israel. Will the call for divestment bring results? Left-wing writer Naomi Klein has argued that divestment is the most important part of BDS because big companies have the ‘real power’, not individuals. The multinationals do have potential power to inflict sanctions, but profit is their prime motivation, not human rights or workers’ living standards. They are usually willing to do business with the most oppressive regimes in the world if it suits their balance sheets. So it is of little use to simply appeal to their good nature or beg them to act. The way to force them into doing anything is through the campaigning weight of the force in society that has far greater potential power than big business: the organised labour and trade union movements. However, although there can be successes in pressurising large companies to disinvest, etc, this type of campaign will again be of an auxiliary nature. Capitalism globally is a chaotic system; when businesses disinvest there will be others which will step into their place. Before the Oslo peace process, to comply with the Arab boycott of Israel, many multinationals boycotted Israel because the Arab market was important to them. But this large-scale boycott action didn’t stop the repression of the Palestinians. In any case, only critical support at most should be given to boycott campaigns driven by capitalist Arab, Muslim or other ruling classes, because these are not motivated by the interests of ordinary Palestinians. Rather, these elites carry out such campaigns and propaganda to boost their domestic support while, in reality, they have much more in common with the Israeli capitalists than with workers and the poor in their own countries. It is labour and trade union organisations internationally that should be deciding what type of BDS campaigns should be run. How effective was the boycott campaign against South African apartheid? The boycott of South Africa played a role in the global activity against apartheid, but it was not the decisive force that removed it. It was defeated primarily by mass action of the black working class, including strikes and civil disobedience. The South African economy actually grew during the years of the boycott, as has the Israeli economy since the BDS campaign was started. In apartheid South Africa, an overwhelming majority of the black working class supported the boycott against a white elite. In Israel, a majority of the working class is not calling for a boycott of Israel, and this needs to be recognised, even though it doesn’t mean that certain boycotts should not be supported. It does mean, however, that socialist and workers’ organisations internationally need to explain to Israeli workers that they are not targeting them, and take an approach of helping to expose the class divisions in Israel. Should trade unions internationally have links with the Israeli trade union federation, the Histadrut? The Histadrut leaders have always had close ties with the Israeli elite. They play a similar role to right-wing trade union leaderships globally, trying to head off workers’ action as much as possible and do deals with the bosses that fall well short of what workers – Jewish and Palestinian – are demanding. The Histadrut leaders supported the brutal war by the Israeli military on Gaza in 2008/09 and the 2010 attack on the Gaza aid flotilla ship. But their declarations on these issues were not made after democratic discussion and debate among the rank-and-file of the union federation. Sections of Israeli workers are regularly denouncing the Histadrut leaders for not acting in their interests. For instance, social workers criticised them during and after their 2011 strike. In 2012 a majority of the rail workers left the Histadrut in disgust following a battle against privatisation (many felt compelled to re-join after a court ruled that only the Histadrut could represent them). A vital task that Histadrut members face is to remove the leaders that are holding back workers’ interests, and to replace them with leaders who will be under the democratic control of the membership. Meanwhile, links should be maintained by trade unions internationally with the rank-and-file workers in the Histadrut – encompassing over 700,000, the overwhelming majority of organised workers in Israel, including Palestinians and migrant workers. It is more workable to maintain links with the rank and file if formal links are maintained with the Histadrut leadership bodies, not in order to give any support to the positions of the union federation’s bureaucracy, but to have a dialogue and links with the organised Israeli working class. Previous articleSeamus Whelan on the Ballot!